Recognizing the inseparability of art and protest, Brooklyn, NY group ARTE employs visual art to amplify young people’s voices and organize for human rights. Through a focus on leadership development, ARTE empowers youth to bring leadership to their own communities while confronting human rights issues locally and internationally. ARTE engages young people to amplify their voices and organize for human rights change through the visual arts. ARTE uses art, design and technology to empower them to develop creative solutions and bring awareness to local and global human rights challenges while fostering leadership opportunities to train and organize other young people in their communities. ARTE was founded in 2014 with the hopes of connecting New York City youth of color to the resources and support they need to become powerful agents of change. 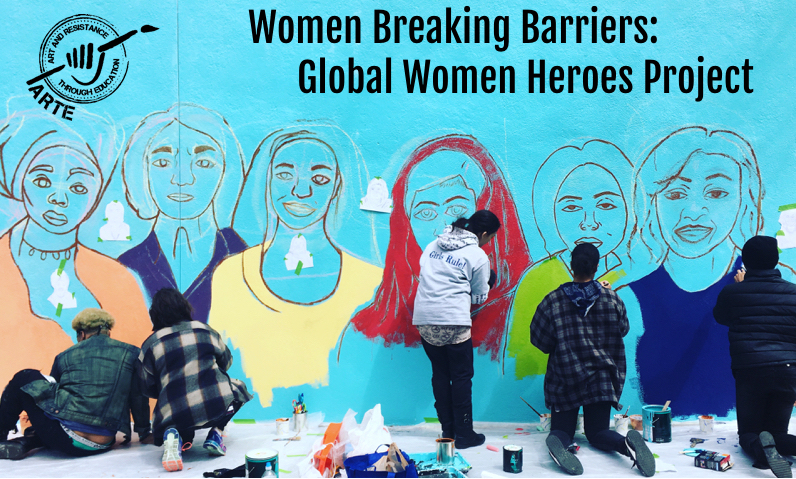 Since then, they have impacted more than 2,700 individuals (mainly young women of color) in arts programs, workshops in community-based organizations, academic institutions and jails. Beyond educating youth about human rights, ARTE equips youth with the skills to disrupt the systemic violations of their own rights and the rights of others. ARTE has led five year-long school programs. This spring, they are developing a cohort of five to ten youth to be trained to organize their peers in advancing human rights change. The persistent and widespread de-funding of arts education in New York public schools threatens low-income communities of color, who make up the majority of students in public schools nationwide and lack access to quality educational resources. Within many of the schools ARTE works in, ARTE is their only access to a visual arts education. Schools also fail to provide disadvantaged youth with education and awareness around basic human rights, denying them the ability to autonomously address the issues that routinely affect their communities. ARTE is a woman-powered organization that supports the empowerment of its staff and interns as they make change, grow their professional skills, and become human rights activists through the arts. Additionally, they believe that young people of color, directly impacted by immediate harms and historical trauma, can best identify and have the leadership power to address the issues of their communities. To practice this, ARTE invites youth leaders to engage in a long-term process of leadership and engagement. Through ARTE’s curriculum, youth learn about the inalienable, indivisible and interrelated nature of universal human rights. Frequently, their mural projects are reflective of this overlap, evoking issues such as mass incarceration, gender equity and racism. Students are engaged to think critically about how to mobilize their communities around these issues. ARTE finds concrete change is possible when traditionally invisible voices are acknowledged and amplified. ARTE collaborates with schools, jails and other community organizations across New York City. They frequently teach the story of Kalief Browder, a black teen wrongfully accused of and arrested for stealing a backpack and incarcerated at Rikers Island jail for three years before committing suicide. They work at Rikers in collaboration with the Colombia Center for Justice along with #CloseRikers and the Raise the Age movement. ARTE tracks the number of volunteers and participants who attend monthly workshops. They conduct volunteer and event evaluations for feedback and improvement. They use surveys to track the growth of students’ knowledge, skills and motivation regarding human rights issues, as well as students’ growth in social intelligence and optimism. Youth of color are not provided the tools to autonomously address the root causes of inequality that will affect their communities for the rest of their lives. ARTE seeks to facilitate that connection and in doing so, recognizes the strategic importance of shifting traditional narratives surrounding people of color in the U.S. By preventing the elimination of art education funding, and partnering with communities to connect disparate youth from across the city, young people may ultimately recognize their own civic agency and lead in the pursuit of justice.